The third apartment at The Setai for Designer Visions was designed by Steven Gambrel for Town & Country magazine. It has just been published in the December issue if you want to read more about it. As you know, all the spaces were inspired by a film set in New York and Steven chose Six Degrees of Separation. The husband of the couple, Ouisa and Flan Kittredge, was an art dealer and Steven imagined how their life would have unfolded since the film debuted in 1993. He imagined that they would have sold their pre-war apartment on the Upper East Side after their children moved out and moved to this modern apartment in Midtown. It would be a mid point between the artwork uptown and the galleries downtown and a perfect place to entertain. I know everyone is going to ask about the fabulous blue color of the walls and it is Blue Agave from Ralph Lauren Paints. It reminds me of the color of Steven's own living room. Steven Gambrel designed the banquettes in Donghia Ginger silk mohair that are the main seating area in the living room. The lamp is by Adnet and the paintings are all from the 1950's. Steven didn't see the couple as the type to lounge about in a traditional living room so he designed two custom tables to create a space to work, dine, play, and study art. All of the designers used easels in their spaces to display art this year. You'll notice in the Town & Country spread there are framed glass art around the perimeter of the room to soften the windows. They were removed around the time of my tour for safe keeping during an event. 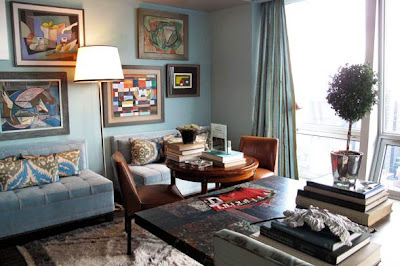 As I mentioned, Steven custom designed the sawhorse tables in this newly imagined living room. They are covered with Italian marble papers that were coated to make them impenetrable. I need to find out who fabricated them because they are perfect for families with children! I love the abstract artwork that perfectly coordinates with the wall color. I might have just done one table instead of two to allow for more seating but as you'll see later, there is a seating area in the master bedroom. You definitely can't entertain without a bar! The cabinet opens to reveal the initials of the craftsman as well as the date it was created. The kitchen can be closed off with draperies of beautiful Bergamo fabric. If you entertain, it's nice to be able to hide the kitchen especially if you have hired a catering staff. I an an uptown girl but I might be tempted to move to Midtown to enjoy this view! Steven said he capitalized on the "amazing western views at sunset" by painting the walls of the library the "exuberant" Bitter Orange from Ralph Lauren Paint. I love the draperies that soften the room in Pallas by Bergamo. The easel holds a special screen that can be used to watch television or movies and also play games. The bulletin board in the Kittredge apartment organizes invitations and art opening announcements and could easily be replicated for your own home. The small powder room was painted in Ranchitos Red from Ralph Lauren Paint. The photo is of Dennis Hopper and is part of his estate collection that will be sold at Christies in January. The master bedroom fabrics soften what could have been a cold room. Even the bedside tables have been draped in Bergamo fabric Simonetta. This room was designed to sleep and relax which would include watching the flat screen television. The artwork in the room is also from the Dennis Hopper estate collection to be sold at Christies. There was a matching chair to this one in the library. One is original and one is a copy that Steven had made to match. 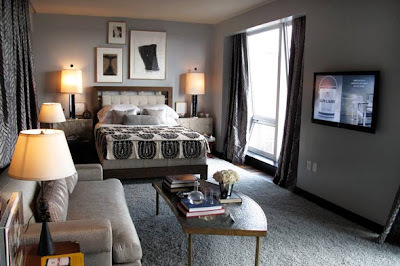 This suite style of bedroom is great inspiration for those with large master bedrooms or even a studio apartment. The gorgeous 1940's Italian mirror and dresser are from Bernd Goeckler. 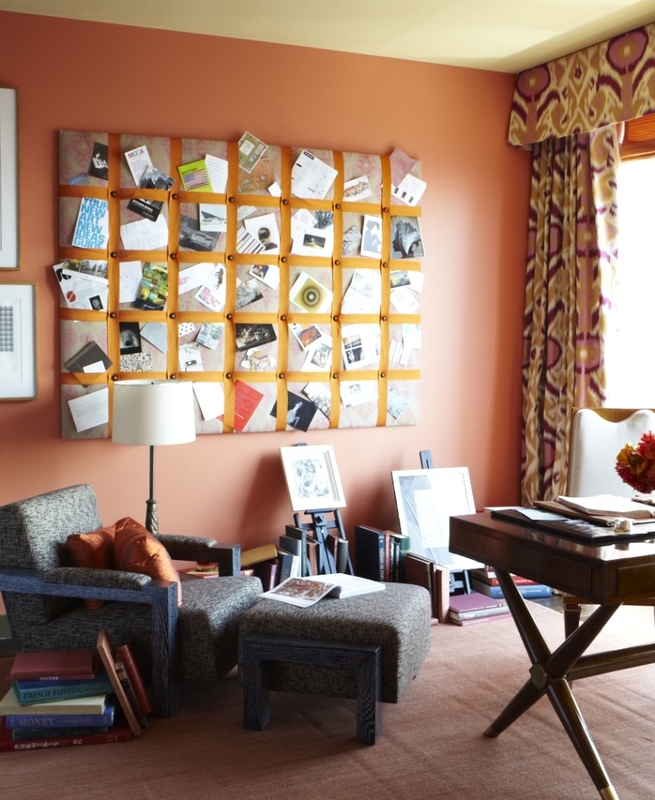 The soothing wall color is Pale Gray by Ralph Lauren Paint. You can see in this photo that the bathroom is open to the bedroom. You can close the doors but Steven also hid the opening with the curtains. You could always leave it open and admire the view while you're taking a bath! 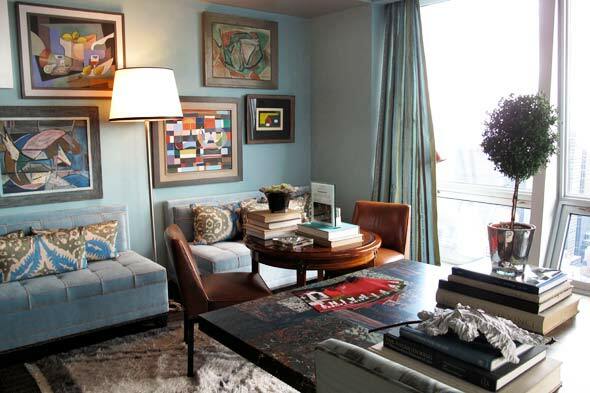 Don't forget you can see more of this apartment by Steven Gambrel in the December issue of Town & Country!